The two most difficult elements of the dish for me were the preparation and the final 10 minutes. Dylan chose the dish for me because he wanted to challenge me on flavour and my ability to taste what I was preparing. I found the preparation gruelling, in particular the artichokes. Check out the ingredients list. It’s mental! But when the dish started coming together, it was well worth the slog. When my time came to plate up, it was a real pressure test. It was a matter of getting all the elements complete at the same time and getting eight identical plates out to the critics. It was a real rush, and Dylan definitely got the extra 20% out of me. I even broke a sweat! And so to the critics. I was nervous. Very nervous. 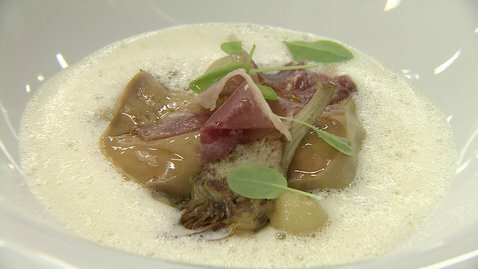 Oliver Dunne started and said the dish was perfectly executed and seasoned. I was sure there was a catch. But the positive feedback kept coming. Martin from the Cliff House brought me down to earth when he said it was one dimensional. Interesting that it was the only negative comment, but I have to take it on board. However to get that feedback from chefs of their standing is a high point in my life and something I will never forget. I think what really stood to me was that I worked well with Dylan and handled the pressure well. When things went wrong I was able to turn it around. I’m guessing that is what it is like in a top end kitchen. Everyone needs to know what everyone is at and bring it all together. You could see from my face that I really enjoyed the cooking and I think that says it all. If you cook with your heart, you have got a good head start. I honestly thought Brian was a certainty for the final. Until I saw it on TV last week, I didn’t know what the other contestants dishes looked like or what happened in the kitchen. It was tough to watch what happened to Brian and I really felt for him. He is such a great guy, knows so much about the science of food, and even though he gave me a pigs jowl a few weeks ago, I can count him as a friend for life. Tomorrow you will see me in London and Stockholm, before returning to the Masterchef kitchen to cook one last time. Definitely no room for any mistakes now. Until the Final! !